Thin, lightweight kangaroo full grain with a waxy finish which enhances the natural characteristics of the leather. It has a firm handle that will relax with wear. 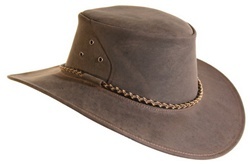 Features a round braided hat band. Small crown, medium brim.